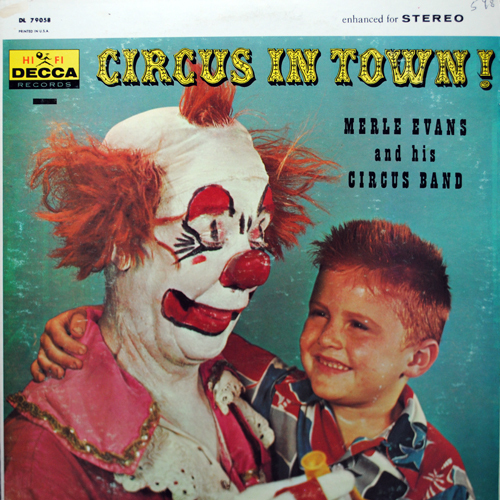 Vintage Vinyl Revival - Buy LP Record Albums, 45's, 78's too » Evans, Merle : Circus in Town! Merle Evans : Circus in Town! In musical circles the world over and in thoughts of millions of American circus goers, the name of Merle Evans means circus music …the galops, the rousing marches and lilting melodies of the big top. He is its living symbol, its dominating, beloved exponent. Musicians consider Merle Evans a remarkable guy. He was born in Columbus, Kansas, and ran from home to lead a carnival band when he was only sixteen. he graduated to the baton of the Greatest Show on Earth (1919) and for 37 years led that band without missing a performance. The world of red wagons and white canvas knows him as the greatest exponent of real circus music in the whole spangle-studded history of this form of entertainment. On into The Big Top. Every seat is filled and still the crowd pours in. Suddenly there is a loud fanfare; great red curtains are drawn aside; beplumed Merle Evans, resplendent in a uniform of red-and-gold, leads his famous band into the crowded tent at the head of the beautifully costumed “spec”. To the stirring notes of “Caesar’s Triumphal March” the circus performance begins! For this is the day the CIRCUS IS IN TOWN! I’ve seen a lot of scary clowns but that one – that one is the scariest.